Wedge Worldwide loves Dr. Bronner's! They are an amazing example of an ethical, green company that is committed to doing good in the world. And their all-natural body care products are amazing! 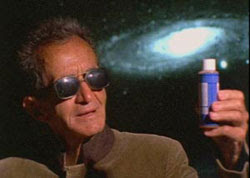 Their companies founder Dr. Bronner (pictured above) believed "constructive capitalism is where you share the profit with others and the earth from which you made it!" The company's Fair Shake Program, which gives assistance to individuals who have just been released from prison, is a great example of this constructive capitalism. We all need hope and opportunity to succeed. Formerly-incarcerated people are among the most stigmatized and least regarded segments of our population. Since they often lack ways to prove pro-social ambitions, employers, property managers and neighbors are justifiably skeptical of their intent. When they are shunned by communities, their chances of staying out of prison are further reduced. Desperation then leads to poor decisions and increased risk. HealthFair Shake offers these studies through a variety of educational formats, including a self-guided web site simulation program, in-prison and in-community workshops, printed materials and their web site. A handy re-entry tool kit is also available to anyone who is incarcerated, whether or not they participate in the program. The Fair Shake Web site is available to former inmates, families, employers, property managers and community members. Formerly-incarcerated people will be able to create a personal web page and an email address to encourage communication and networking and offer a place to present information to potential employers, family and property managers. People who break the law need a "time out" to understand the gravity of their crime, reconsider their role as a member of our society and plan their return to the community. Once they have served their sentence deemed a fair punishment for their crime, formerly-incarcerated people should be able to make amends and get on with their lives in a productive and peaceful manner. As taxpayers, we are all investors in corrections, and a 32% success rate is simply unacceptable — considering both our safety and the return on our investment (ROI). A reasonable ROI will be realized when we slow the revolving door and cease to repeatedly warehouse the same people. Only then will we truly become "tough on crime."